SLS, SLES, Paraben and Fragrance Free. A rich botanical blend of Aloe Vera, Seaweed and Ginseng works in synergy with oils of Centella and Rosehip to lock-in moisture, condition and revitalise tired lifeless hair. 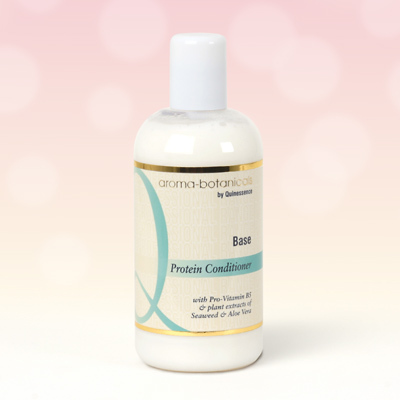 This deep-conditioning professional base is enriched with Pro-Vitamin B5 to help strengthen hair and prevent split ends. Simply add your own essential oils to make a personalised aromatherapy hair treatment that's just right for you. Essential oils may be added up to a 2% concentration, although 1% would be sufficient under normal circumstances. Aqua, Cetearyl alcohol, Glycerin, Cetrimonium chloride, Aloe barbadensis, Dimethicone, Hydrolyzed Keratin, Hydrolyzed Wheat Protein, Panthenol, Panax ginseng, Centella asiatica, Rosa canina, Fucus vesiculosus, Spirulina maxima, Tocopheryl acetate, PEG-15 Cocopolyamine, Citric acid, Gluconolactone, Sodium benzoate, Calcium gluconate.